Description Scanned as B & W. Same as photo 17b; negative with photo. Notes on front of 17b: Site of Bryant school; Hop Harvest 1905. Caption from news article from library vertical file says: "Hop[s] once grew where new River Grove School now stands. It will be dedicated Tuesday, Jan 21 [1968 or 1969?] at 8p.m. 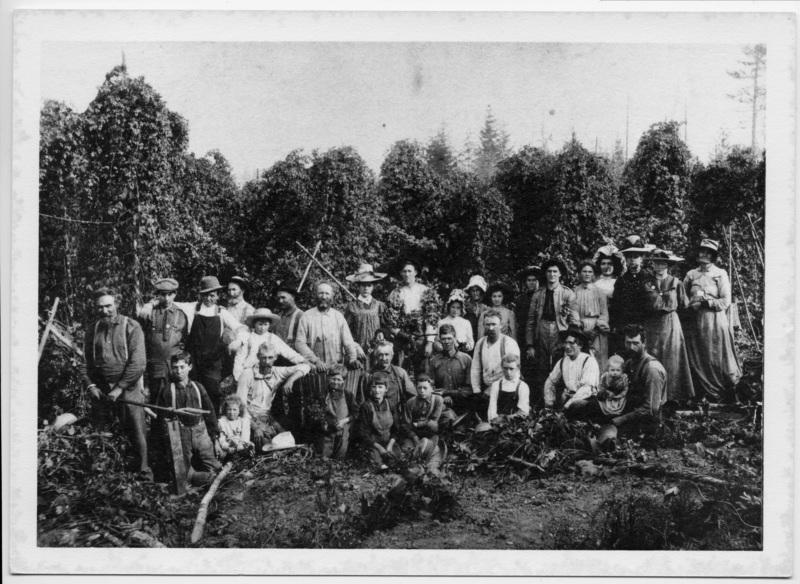 Typical 1905 harvest included Howard Worthington, (left front) Vera Wirth, Charlie Childs, Joe Wirth, Lloyd Wirth, Tom Elson, Arcenius DeBauw, Johnny Fredericks, Len Wirth. Second row, left: Harold Baker, Grandpa Wirth, Molynx and William Wanker. Third row left: first man unidentified, Leslie Whitten, Billy Worthington, Alpert Thompson, Hugh Baker, Joe Beverts, Zena Whitten, Bob Whitten, Emma Darling, Mrs. Molynx, Nina Worthington Emmett, Evvie Hayes Whitten, Frank Whitten, Mrs. Len Wirth, Bertha Worthington, Ethel Worthington, Ethel Baker Cook and Mrs. William Worthington." There's an additional information sheet of names filed with the photos.